The following group types are not accepted by this hostel: Junior / Primary School, High / Secondary School If you have misrepresented the type of group you are booking for, your booking may be cancelled by the hostel. Located on Zagreb's main street this former factory has been transformed into a visitors dream, offering every facility imaginable in true Swanky style, with a gorgeous sun terraces, swimming pool and garden outside the windows of the bar offering the ideal surroundings to unwind after a day spent exploring the beautiful city. Private rooms, separate apartments, dorm rooms big and small, all on offer here at unbeatable value. 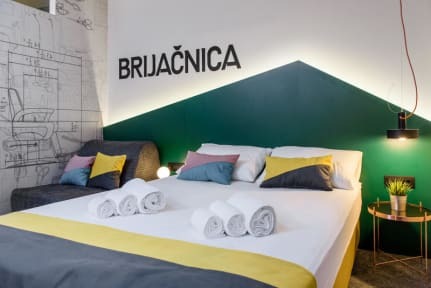 Of course all the amenities necessary for a comfortable stay are free; WiFi, linens, towels, lockers, key cards secured dorms and our traditional Rakija welcome drink with our experienced helpful staff means your stay will be a happy one in the Swanky Mint. *Please give notice if traveling with pets. *If arriving from airport please let us know so we can arrange you a taxi transfer for 15 euros. *Smoking is not allowed in the hostel, only on the terrace. The City Tax is not included in the room price you book on Hostelworld!! It is 10HRK per night or approx. 1,4€. Parking is available in a nearby garage called Tuskanac (Tuskanac bb), and it costs 60HRK per day (approx. 8€). After 3 PM on Saturday till Monday 7 AM, parking is free on the marked parking lots on the streets nearby hostel. This is one of the best hostels I have visited. Coming back for sure!!! Swanky Mint was my first experience in a hostel and I couldn't have a better stay. The place was great, clean, nice and bed with a little curtain let you your privacy also in a dorms. The position is fantastic, two minutes walking from main square, and staff so nice and kind. I can recomend this hostel to everybody. Ostello in pieno centro, posizione strategica per visitare la città. Lo staff è molto gentile e disponibile. La pulizia è ottima visto che le camere vengono pulite ogni giorno. Unica pecca è la presenza del locale dell'ostello vicino alle camere, la musica è piuttosto fastidiosa se cercate di riposare. Noi abbiamo pernottato per due sere ed il locale ha chiuso a mezzanotte circa, peccato che alcune persone siano rimaste ben oltre la chiusura parlando a voce alta e disturbando non poco. A good hostel to stay at. The staff is helpful and available, personally thought the hostel was too big and dispersive to actually meet anyone though. The rooms are really nice and the bathrooms are okay, the lockers are quite big to fit my entire backpack in. If you're a party person, this is the hostel for you!